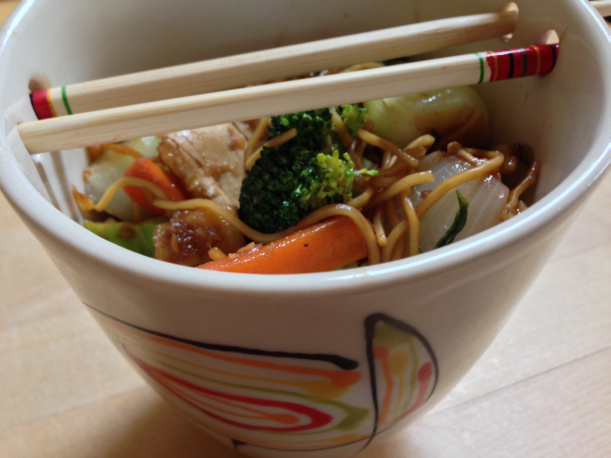 Loaded with fresh vegetables a and with Chinese seasoning such as a soy sauce and sesame oil,this tasty vegetable chow mein buzz your taste buds. In a small mixing bowl, mix all the seasoning ingredients. Set aside. Heat up the wok with the sesame oil. Add in the chopped garlic,minced ginger and stir-fry until light brown or aromatic. Add the meat free Crispy Chick’n and stir fry until they are half done. Add all vegetable into the wok and do a few quick stirs. Add the noodles , the seasoning mixture and the water. Continue to stir until the noodles are well blended with the seasonings and completely cooked through. Dish out and serve hot.